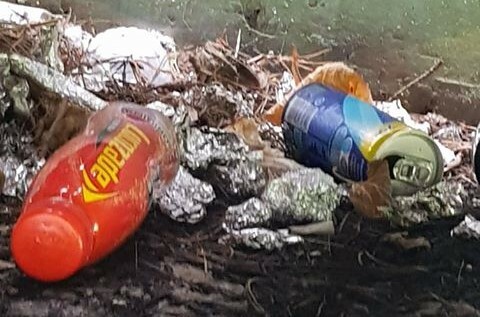 Kildare County Council has said it is engaging a contractor to remove drugs paraphenalia material and rubbish left under the bridge in Newbridge. The Leinster Leader reported on the rubbish last week and republished video and photographs taken by concerned local Steven Fegan, of the rubbish. Numerous pieces of tinfoil and cigarette boxes were among the items found. Mr Fegan was concerned that the rubbish, and the drug use that created it, was close to where locals bring their small children to feed the ducks and swans, and said he had stopped taking his kids there. And he felt the Gardai should install CCTV to prevent it. However when Mr Fegan contacted Kildare County Council it was explained to them that, being under the bridge, it is a matter for Waterways Ireland and that they would contact them. However in a statement to the Leinster Leader this morning, the Council said tha the “area is in the public domain of Kildare County Council”. Local TD Fiona O’Loughlin, whose Newbridge office is just on the bridge said the footage had made her “skin crawl”, to the point where she couldn’t watch the entirety of the footage. “You have to wonder why people would do this, and not take responsibility for their own environment,” she remarked.